These chapters, like Part One, are packed full of information that can be somewhat intimidating as well as helpful. Because there are many protocols to follow, I suggest you engage the help of a natural healing practitioner unless you can see Dr. Kelly in person in New York City. Another alternative is to do this with a friend so you can support each other when you feel overwhelmed, kind of like having a walking partner to get you up and out the door. Food isn’t just fuel; it’s information….The idea that chronic inflammation and a perilous disconnect between the body’s inner ecology and the brain—not low levels of brain chemical—is at the root of most forms of depression will only continue to gain traction in academia and medicine. .…but prolonged sleep deprivation can have serious consequences, including depression. In the past three decades, more than 10,000 chemicals have been approved for commercial use in the United States. Among these are more than 85,000 industrial chemicals, 10,000 food additives, 12,5000 personal-care ingredients, 1,000 pesticide active ingredients, and scores of pharmaceutical drugs. It protects the brain and nervous system, regulated rest and mood cycles, and keeps the immune system functioning properly. A severe deficiency can lead to deep depression, paranoia and delusions, memory loss, incontinence, and loss of taste and smell, among other serious conditions. This chapter also contains a checklist of several tests she recommends and explains why. Chapter 10 is the actual program to detox and adopt a healing diet with a 30 day Plan of Action. Her diet is not vegetarian, which I would find difficult to follow. But the recommendations are basically natural and support her protocol. Next posting I will include a recipe that is for all diet: Cauliflower Rice. 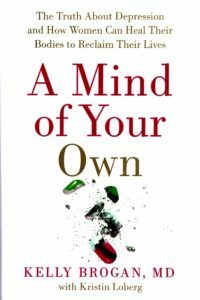 A Mind of Your Own is a comprehensive program that makes a great deal of sense, especially because she explains why western medication really doesn’t do the job as well her protocol. But if you are on medication, you need to discuss Dr. Brogan’s “revolutionary” mental health protocol with your doctor if you want to try it. Published by Thorsons, an imprint of HarperCollins Publishers, the book varies in price depending on whether you want the Kindle version ($13.99), hardcover ($26.99) and used starting @$13.66, with different prices in Canada. P.S. I am now posting in two places on my site: my Home Page and for this posting, Reviews. This entry was posted on Monday, June 12th, 2017 at 9:33 am	and is filed under Home Page, Reviews. You can follow any responses to this entry through the RSS 2.0 feed. You can skip to the end and leave a response. Pinging is currently not allowed.